The arrival of warm weather has people shedding jackets and long pants, only to become concerned about unsightly hair being exposed. Come Across Esthetic Salon has specialists trained in removing unwanted hair. The process is permanent, but isn’t a magic overnight system. Come Across experts say it takes months of regular treatments before the ugly hair is permanently banished. What many people don’t know, a Come Across professional electrologist points out, is that only 30% of a person’s hair is actually seen; the remaining 70% is hidden beneath the skin, waiting to spring up. All electrologists at Come Across hold both American Technology Association and Japan Skin Esthetic Association certifications. The electrolysis process isn’t new, but has only recently become popular in Japan. Come Across technicians know the methods to treat various skin and hair types, providing high quality service along the way. They say the process is far superior to shaving pr pulling out hairs one by one, and more safe, too. The Come Across professionals emphasize that self treatments are likely to cause major skin troubles. The salon also offers facial courses, weight reduction programs and healing massage. It is located just north of Hanby Town and San-A, west of Highway 58 near Camps Foster and Lester. 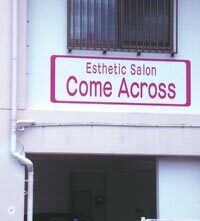 The Come Across Esthetic Salon is located on the second floor of the pink building directly across from Four Seasons Steak House.